Etiquette books were quite popular during the nineteenth century as the general public tried to improve their appearance not only in their material presence but also in how they acted. "Never ask a lady a question about anything whatever." Guidance is included for general conversation, for dinners and parties, for balls, for encounters on the street, and for visiting. There are even some guides for hosts and hostesses. 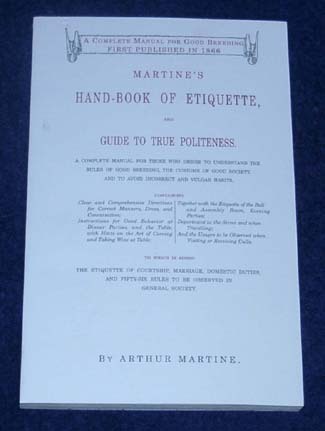 This is just one of many etiquette guides. One observer of the time period noted that she supposed that a lot of people must have been doing the opposite of what was advised. Otherwise, why note conditions where everyone is behaving properly. And when the guidance boldly states that something should "Never" be done because it is "extremely vulgar" could be an indication that quite a few individuals were still engaging in the practice.